São 6.090 METROS lineares de arquivamento em um único sistema. O maior arquivo deslizante do Brasil. The OFC is a company specialized in solutions for archiving, storage, organization, security of information and materials. With coverage throughout Brazil, we provide to our clients, qualified representatives for advice and efficient service, from the project development to after-sales. We always make a difference using the best quality materials and creating new trends related to quality, flexibility, strength and sustainability of our products. Our professionals are trained to offer complete solutions in information management: perform diagnostics of the current status of customers, develop solutions that provide greater flexibility in information retrieval, help to organize them to let it always safe and available, contributing significantly to the productivity. We ensure the environmental awareness of our workforce by encouraging all employees to act in an environmentally responsible manner. They are invited to contribute to the sustainability of the company, using water, energy and raw materials more efficiently and conscious, optimizing the use of natural resources. Sustainability is not only incorporated into the manufacturing processes but also in the concept and design of our products. 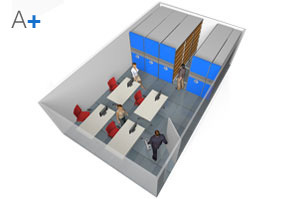 By optimizing your space, you will have the ultimate in efficiency, helping to reduce operating costs, fuel and power consumption. 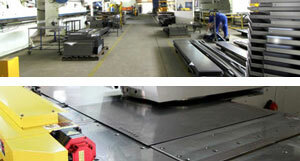 We are constantly evolving, developing and researching new ways to work in harmony with the environment. With static files is a waste of space in relation to mobile systems. Up to 70% of the space saver with a smaller investment and / or use the space more efficiently. 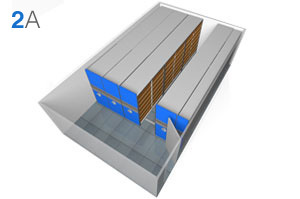 Double the storage capacity using just an aisle. 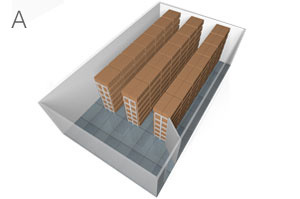 © 2013 OFC Storage Systems.